The Royden Donahue Exhibit Gallery is the central focus of the Museum, and contains educational exhibits and a reading room for your researching needs. We are also home to the Credit Union Art Gallery where, in partnership with the Biggar District Arts Council, we bring Visual Arts to the community. In the Credit Union Gallery you can expect to see both fabulous local artists and renowned Canadian artists whose works are relevant and interesting to the rural community. And don't forget to visit our Gift Shop! However, The Biggar Museum doesn't just deal with historic artifacts and research information. Many community events and fundraisers use our facility as a home base, and we are thrilled to have them! The "Photo Gallery" page shows a sample of events we have hosted throughout the years and the "Calendar" application allows viewers to become active in these events. 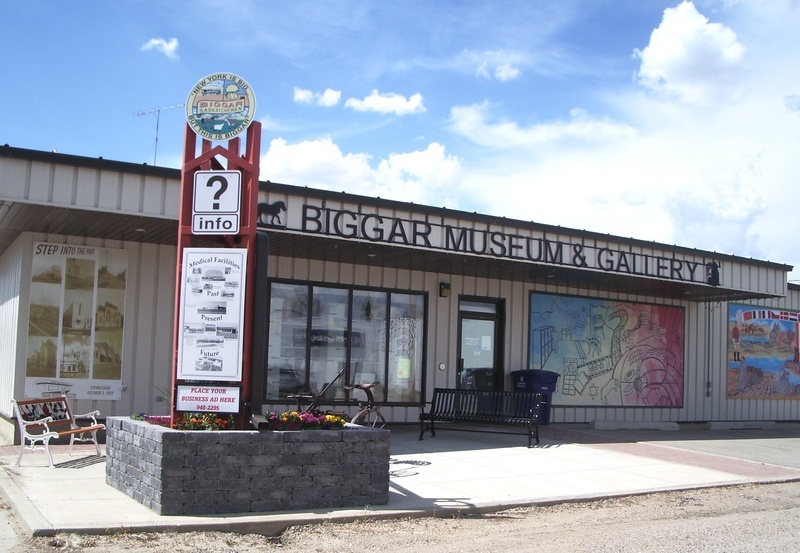 Please take a look around, and familiarize yourself with all the fun and interesting things that the Biggar Museum & Gallery has to offer. Enjoy, and we hope to see you soon! Our hours: WINTER - After Labour Day to after May long weekend Monday - Friday 1:00 - 5:00. SUMMER After May long weekend to Labour Day Tuesday - Saturday 9:00 - 5:00. Closed for lunch everyday noon until 1:00.